You can set a new password if you forget it. If you are already logged in to the website, browse "Reset password" then click "Email reset link and log out". If you are not logged in, browse "Login" then "Reset password", enter your username or Email address then click on the "Email password reset link". You will receive an Email containing a link that can be used to log in only once. This link will lead you to a page where you can set a new password for your account. No, your email address shall not be disclosed to anyone. Your user name and avatar picture are the only visible information. How I will be notified about the new updates on the "Intraday Forecasts"? Subscribers will be notified about the new updates on the "Intraday Forecasts" in two ways. Intraday Indicator shows Forecast City Intraday Forecasts directly on MetaTrader4. Using Intraday Indicator, subscribers don't need to browse the website from time to time for latest updates. How can I unsubscribe notifications? How can I unsubscribe newsletters and notifications that pops-up on my desktop? 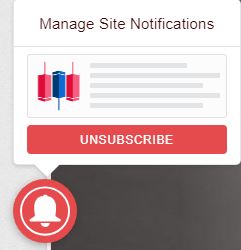 To unsubscribe Notifications, click on the bell at the left corner of the page and choose to unsubscribe. Remember that if you are using multiple browsers, it must be done at all of them. When you click on Unsubscribe you won't receive notification again. Why even after I did unsubscribe on notification as you said, notification pops-up? You may continue receiving notification because you are using multiple browsers or one browser with multiple accounts. Click on notification when it pops-up. The browser you are subscribed will open. Then to unsubscribe click on the bell at the left corner of the page. How can I change time zone? Dates and times throughout this site will be displayed using this time zone. During registration, your time zone setting will be automatically detected if possible, but you may also select your desired time zone in 'Locale settings'. Anyway if you need to change it, please browse to your account, then click 'Edit'. You will find your selected time zone under 'Locale settings', select desired time zone, and click 'Save' at the bottom of the page. When are you in the online support? We are online, more than 12 hours per day and 7 days per week. We try to divide the online time between the working hours of the whole world. Do you explain forecasts at online support? No, we don't. At online support, we don't explain technical analysis. We do not provide a private consultant in technical analysis or money management. How can I advertise on ForecastCity? The new plans of advertising at ForecastCity will be offered in a few months. We would like to know more about you and your business. If you have the website, please provide us with your info. You can also email us to [email protected]"
How many signals do you send out? The first thing you should know is that we don't provide signals. We provide forecasts which are different from the signals. Although forecasts have an entry, Stop Loss and Take Profit that can be considered by the traders in their analysis. Also, we provide DTO to subscribers. "Weekly Forecast" for 26 Forex Pairs, 6 CryptoCurrency, Gold, Silver and Oil. "Daily Trading Opportunity" (DTO) for 28 Forex Pairs. "Intraday Forecast" for 9 Forex Pairs. Is there any discount on subscription fee? Yes, There is. The monthly subscription fee is $65/mo and discounts are on long subscription plans. Please visit the page subscribe! for more details. Yes, you can. For instance, if you travel regularly and there may be times when you are without a proper internet connection, you can put your subscription on hold. For doing that just contact us. What is the Trial period of subscription? To introduce ForecastCity's services, we offer one-week subscription as a trial period at cost of $19.95. What will happen at the end of the trial period of subscription? According to the agreed Paypal terms and conditions, at the end of the trial period, your subscription will be automatically renewed with the price $65 for one month. Should I pay for a trial period of subscription only through PayPal? No, you shouldn't. All the payment methods listed on the site is also available for trial subscription. You can choose either Paypal or other methods. Is automatic renewal available on all the payment methods of subscription? I'm afraid it's not. Automatic renewal is working only on Paypal payments. And according to ForecastCity terms and policy, your subscription paid through Paypal will be renewed automatically at the same discount rate. How can I cancel Paypal automatic subscription renewal? If you have paid through PayPal, simply find the last payment to "Forecast City" at your PayPal profile, then cancel the recurring payment. Would you please cancel Paypal automatic subscription renewal for me? It is not possible to cancel Paypal automatic payment through us. According to our terms and policy, your subscription paid through Paypal will be renewed automatically at the same discount rate, unless you cancel it by yourself. If you decide to cancel the subscription, please log in to your Paypal profile and cancel the renewal. For which pair of currencies "Intraday Forecasts" will be published? "Intraday Forecast" will be published for 9 Forex Pairs. What is every day free forecast? Randomly, we present one of the intraday forecasts freely every day for everybody. For which pair of currencies "Weekly Forecasts" will be published? "Weekly Forecasts" will be published for 26 Forex Pairs Plus Gold. For which pair of cryptocurrencies "Weekly Forecasts" will be published? For which commodities "Weekly Forecasts" will be published? For which pair of currencies "Daily Trading Opportunities" (DTO) will be published? "Daily Trading Opportunity" (DTO) will be published for 28 Forex Pairs every day. I am looking for a chart which is not on your "Weekly Forecast" list. what should I do? "Non-stop, more & more features"
One of our visions is to provide as many charts as possible. We believe in "Non-stop Profit". It means that "More Charts = More Profit" and "More Charts = Less Risk". So, If you are looking for a forecast which is not on the "weekly Forecast" list, you can send us a request to add it. Also, the priority is with the most demanded and favorited charts. How does it work? Do I send you money? No, our clients do all their trading through their own broker. We just charge a very reasonable monthly subscription fee and don't recieve any money from our clients. We teach them how to trade for themselves. How much money do I need to start trading at FX Market? All you need is an internet connection in the beginning. If you're a beginner in FX Market, we would suggest starting with zero - that's right, nothing. You can learn and improve with a 'Demo' account before you risk any actual money. You need to learn at least the basics before you even think about throwing money at a trading account. However, Mini accounts can be set up for as little as $300 or even $5, it depends on your broker choice. If you can use a calculator you're ok.
Do I need to be an aggressive person? No, currency trading is highly leveraged (usually at least 50:1). So, being too aggressive is not a useful characteristic. In fact, it is better to be calm and steady. How much time do I need to spend on it? This depends on your trading strategy and methodology. With many strategies you have to watch your screen all day. But with our Trend Hunter Strategy, you can spend a lot less time and still be very profitable. At maximum, you need 30 minutes per day. Do I need to have financial experience to be successful in online trading? Financial experience is not necessary to be successful in online currency trading. There is no limitation in this market. The only thing that prevents you from developing in this market is being unsteady, lack of discipline, and being inexperienced with a low amount of knowledge. Therefore, we recommend firstly learn and then you yourself will see how much you can earn. Trading in a leveraged product like Forex cannot be described as low-risk. By operating proper risk management rules, this is a medium-risk/very-high-return business. To make it very simplified, we like to gradually build large positions on major trends. We believe this is the best way to do really well financially from Forex trading whilst controlling risk. You have to pay your broker commission when you trade. The amount varies according to your broker, however it is almost always a percentage commission rather than a flat rate. We try to stay as unbiased as possible by not recommending specific brokers. This is the best for "Forecast City". However, considering that every trader has his/her own approach and trading style, one broker might be proper for one person but not another. 2Next, by using the broker comparing software you can simply select the number of brokers you wish to try out and review them. The broker comparing software enables you to see all the main important points and services regarding their facilities at the same time and compare them in a simple and quick way with confidence. Which broker's chart is used in your technical analysis? We use the broker that offers "Standard Daily Candle" as we mentioned at the pages "Release Time of Daily Trading Opportunity" and "Release Time of Intraday Forecast". Does using "Intraday Indicator" cost extra charge? No, it doesn't. Using "Intraday Indicator" is free and we do not charge you for using it. Do I enter "username" and "password" of my demo/real account in the "Intraday Indicator"? No, you don't. The "username" and "password" that you log in to ForcastCity is needed to set up "Intraday Indicator" on your MT4. Why my Username and Password is not accepted when I add "Intraday Indicator" to the chart? I added the intraday to MT4, but when I add to the chart, it's providing to add the username and password. I am putting the username and password, but nothing happens on the chart and again reopen to enter the same. WHY? If your password contains punctuation marks or ([email protected]#$%^&*()_+ ), it won't be accepted. Please change your password and try again setting up inputs. Your "password" should contain only letters and numerical digits. Remember, the username and password that is used to login to "ForecastCity" are required NOT YOUR METATRADER ACCOUNT INFO. How can I type the username and password in the Custom Indicator box? When you add Intraday Indicator to the chart, by double click on the box, you can type the new value. Does Demo or Real (Live) account matter to use "Intraday Indicator"? No, it doesn't. It doesn't matter which type of accounts you are using. Because "Intraday Indicator" is not restricted to account type whether your account is Demo or Real, you can add it to MetaTrader4 and use it. The account number is the only required info which is needed. Can I use "Intraday Indicator" on my mobile? No, You can't. You can not use "Intraday Indicator" on your mobile because on mobile MT4 there is no possibility to add custom indicator. Can I use "Intraday Indicator" on any broker or I am restricted to your provided list of brokers? Yes, you can. You can use "Intraday Indicator" with any broker that provides Metatrader4. "Intraday Indicator" is not restricted to account type or broker. So with any broker, you can add it to the chart of MetaTrader4. Forecasts are not drawn in weekends. Indicators are refreshed by market ticks (which is new symbol quotes received by platform). So, when the market is closed during weekends, no new incoming tick is received, you must manually refresh the chart by selecting Refresh when you right-click on the desired chart. Meanwhile you can close the platform and run it again or reload current profile. As there may be some bugs in the release version, indicator developers name the version as Beta, after some period of testing and feedback from clients, bugs will be fixed and then the stable version will be released. Which operating system (OS) is supported? Currently we provide our Indicator for MetaTrader 4, the Indicator calls some of Windows DLL functions to get forecasts, so you will need Windows XP or higher. Which MetaTrader version and build number is supported? Currently MetaTrader 4, build numbers above 509 is supported. If your platform build is old, you can download the latest build through your broker website. The build of platform is located in About item of Help menu. It might be shown on your MT4 because of the expired demo account or disconnected internet. Take Profit orders can be used by traders to lock in profits by closing a position before the price of an asset starts moving in an unfavorable direction. Similar to Stop Loss orders, a trader predefines a price level which once has been met to trigger an automatic closing of the position. Thereby, earning profit from any potential loss due to a market reversal trend is secured. Stop Loss orders enable traders to limit any potential losses they may incur from a trade if it goes against them. Before entering a trade or even after you open a position, you may set a price level at which a stop loss order will be triggered if the asset price meets that level, leading to the closing of your position. Traders are able to minimize their risk upon entering a trade and ensure that if the markets move unfavorably, their losses are reduced through the strategic use of Stop Loss orders. We always leave part of our investment without specifying a take-profit point. This way, if the trend goes beyond over the last take-profit point, more profit might still be possible for us. Last take-profit point is usually where a strong support or resistance level exists and it's unlikely expected for the trend to pass over it. Yet, in probability world of financial markets, any event is probable.